Chevron denied pipeline priority – what does this mean? 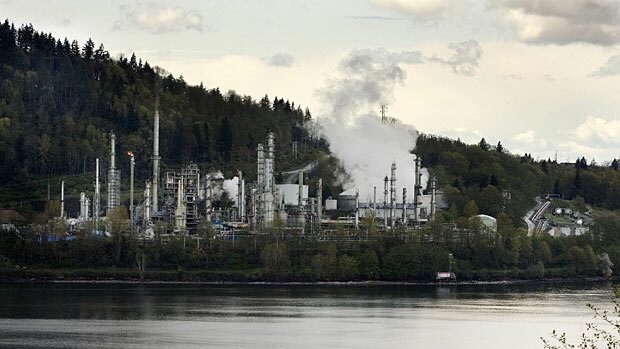 The Chevron refinery in Burnaby supplies about a third of the Lower Mainland’s gasoline and almost half of the Vancouver International Airport’s jet fuel. Most of the crude oil that it refines is received via the existing Kinder Morgan Trans Mountain pipeline; however, around 6,500 barrels currently arrive by rail each day and another 1,000 barrels per day (of 55,000 barrels per day total refining capacity) arrive via tanker truck. The refinery would prefer to receive their crude oil entirely by pipeline, but in recent years they haven’t been able to secure enough space on the Trans Mountain pipeline. Using a rationing (apportionment) system, Kinder Morgan allocates shares of pipeline space out to different customers, including onto tankers for export. Over the past few years, the percentage of pipeline apportionment given to the refinery has steadily declined in the face of increasing demand for oil for export. Chevron representatives have stated that non-pipeline forms of transportation make up the current shortfall but they come at an “extraordinary expense”. In 2012, Chevron applied to the National Energy Board (NEB) for preferential shipping space on the Trans Mountain pipeline. Last week, they were denied this application by the NEB, who stated that priority apportionment should only happen in extraordinary circumstances, and noted that Chevron needs to investigate other options, such as receiving crude oil via tanker into the Burnaby Westridge terminal, before resorting to priority destination designation. How does this relate to the proposed new Trans Mountain pipeline? There isn’t a direct relationship, since the new pipeline would be designed to transport diluted bitumen products, which the Chevron refinery is unable to process. However, the current situation might be an indication that export demand will increasingly trump local gasoline security. How will the decision impact BC residents? This decision might not have a noticeable impact on people living and working in BC. However, there is a risk that gasoline prices will increase at the pump if the Chevron refinery has to continue to rely on costly methods of importing crude oil. There’s also a chance that the Chevron refinery could be forced to close down if unable to secure a sufficient long-term supply of crude oil, leaving the Lower Mainland and Metro Vancouver reliant on gasoline imports. This blog used quotes and information from several news articles, including the Burnaby Leader, Reuters and CBC news. More background and information can be found in our recent report “Assessing the risks of Kinder Morgan’s proposed new Trans Mountain pipeline”.